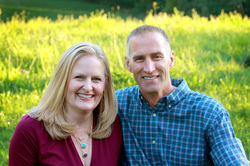 Dr. Brian Carpenter was born and raised in Ann Arbor, Michigan. He attended the University of Michigan and received a Bachelor of Science Degree in Kinesiology. After this he received a scholarship from the United States Navy to attend the University of Michigan Dental School. In 1996 he obtained his Doctor of Dental Science Degree. After completing dental school, Dr. Carpenter joined the United States Navy as a dental officer and completed an Advanced Education in General Dentistry program in 1997 while stationed at MCRD, Parris Island, South Carolina. He served an additional three years as a Navy general dentist supporting the Marine Corps in Okinawa, Japan. Outside the practice Dr. Carpenter enjoys spending time with his family, sports, and exercise. Dr. Elizabeth (Betsy) Leugs Carpenter was born and raised in Grandville, Michigan, and attended Calvin Christian High School. She attended Calvin College for three years before receiving early acceptance to the University of Michigan Dental School. Dr. Carpenter obtained her Doctor of Dental Science Degree in 1995, and was awarded membership to Omicron Kappa Upsilon, an honorary dental society. After dental school she practiced dentistry for one year in Wyoming, Michigan before the Carpenters were married. Dr. Carpenter worked in the dental clinic at MCRD, Parris Island, South Carolina, and at Torii Army Dental Clinic in Okinawa, Japan. Outside the practice Dr. Carpenter enjoys time with family and friends, reading, and crafts. The Carpenters purchased their dental practice on Breton Road in Grand Rapids, Michigan in 2002. They live in the area with their 3 children.